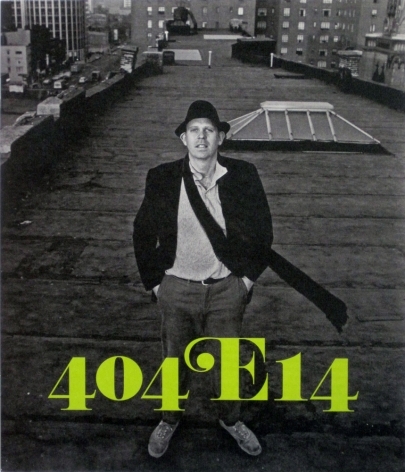 [404 East 14th Street] was a very important place in my life, it was probably the main studio for my work in New York. It was probably the best studio I had in the 60's and the one where I did the most work. It affected the work and it also affected the thinking, I became interested in making large-scale objects in the form of buildings and so on. The gallery is pleased to present a group exhibition of works by sixteen artists who have at one time lived, or had studios, at 404 East 14th Street in New York’s East Village. Beginning in the 1960s, it was among the first in New York to become an artist building, and remains so today. Although stylistically distinct, the artists who have lived or worked there over the years are nevertheless bound together in their shared experience of this uniquely vibrant, artistic scene. The exhibition will comprise paintings, sculpture, and photographs by the various artists, in addition to films, correspondence, poetry and ephemera relating to the history of the building and its inhabitants. To coincide with his current Museum of Modern Art exhibition, Claes Oldenburg will be represented by working maquettes from his collection. A selection of poet Allen Ginsberg’s last photographs, taken when he lived in the building, will be included, as well as a 1966 foam floor sculpture by John Chamberlain. Rarely-exhibited works by Larry Rivers that were created at his 14th Street studio will be on view, such as a portrait of cult writer Jim Carroll, along with a large scale work from his Bad Witch series. 404 East 14th Street (also known as 405 East 13th Street because it stretches the width of the block between 13th and 14th Streets), is an industrial building unique for its sheer size. Surrounded by tenement buildings that are much more typical of the neighborhood, the structure was built in the early 20th century and originally housed a button factory before giving way to a warehouse for the locally-owned Bloom & Krup hardware store. Throughout the following decades a loosely-knit, dynamic community of artists, poets, and filmmakers formed with the building as its epicenter. Although their interactions tended to be more social than creative, a notable exception came in the form of artist Jean Dupuy, a resident who harnessed the collective creative spirit for a series of collaborative exhibitions from 1973 to 1975. Taking place within the building, the exhibitions joined together painting, sculpture, and performance by fellow residents as well as other notable artists of the period. Joseph [Cornell] wore the shabbiest of clothes. He always looked like a tramp shambling down the street with holes in his shoes and a crumpled paper bag under his arm […] I had moved to a studio in a nameless apartment building at 404 East 14th Street. Claes Oldenburg now lived above me, and Larry Rivers above him. One night as Joseph was leaving I accompanied him down to the foyer, and there crossed paths with Larry, who was just returning with a bevy of fashion models. The models, apparently thinking a hobo was in their midst, squealed and skittered out of Joseph’s way. Later, Larry asked me about the “homeless guy” and was astonished to learn his true identity. The exhibition is organized by gallery artist Tom Burckhardt, who currently lives and works in the building along with wife and fellow gallery artist Kathy Butterly. A catalogue will be available and will feature transcriptions of interviews conducted by Burckhardt with many of the artists, poets, and filmmakers who have resided at the building from the 1960s through present day.